London - Macmillan and Co., 1879 Book. VERY GOOD INDEED. Hardcover. A limited, large paper edition, of William Wordsworth's poetry. One of only 750 copies to this large paper edition from September 20th 1879. With an engraved title page featuring a portrait of Wordsworth. In a Baytntun Riviere binding from Bath, England. With an introductory critical preface on Wordsworth's life and works by Matthew Arnold. The poems to this anthology have been chosen and edited by notableEnglish poet and cultural critic, Matthew Arnold. Arnold had a high reputation in therealm of literary criticism. His reputation continued to be held well into the twentieth century. This collection contains many of Wordsworth's ballads including'We are Seven' and 'Lucy Gray'. There is also a section for his narrative poems, lyrical poems (such asthe famous 'I wandered lonely as a cloud') as well as his odes, sonnets and reflective and elegiac poems. William Wordsworth is known as a major Romantic poet who launched the Age of Romanticism in English literature with his friend Samuel Taylor Coleridge. Condition: In a half calf binding with paper covered boards. Externally, very smart with some minor shelfwear to the raised bands and to the head and tail of spine. Spine and top of boards have faded as expected with this colour. Binder'sstamp to verso of front endpaper, Bayntun Riviere, Bath. Internally, firmly bound. Pages are generally bright withthe odd light spot throughout. Overall: VERY GOOD INDEED..
London - Macmillan and Co.. Good with no dust jacket. 1890. unk.. hardback. Blue cloth HB; 331 pages . London, England: Macmillan & Co., 1879. Leather Bound. Very Good/No Jacket. 12mo - over 6¾ - 7¾" tall. Very Good, no DJ. Full leather covers, all edges gilt. Gilt deco on spine and front and rear covers (see our photo). No markings to text block. Previous owner's markings on leaf following front free end paper. Book plate, inside front cover. London: MacMillan and Co.. Very Good-. 1888. Hardcover. 331 pp; 3/4 leather binding with decorative marbled boards that show minor shelf wear & scuffing along edges & corners, previous owner's name on ffep. Scattered light foxing to fore edge, title page, and ep's, pages 41-44 remain uncut but show a long tear down the middle- text is still readable but is affected. Else this is a pretty copy, binding is tight text is clean. ; Always Delivery Confirmation. 35 Years Fast Excellent Service. We Know How To Pack Books. .
Macmillan & Company, 1907. Hardcover. Good. London: Macmillan & Company, 1907. Reprint. Hardcover. 331 pp. Good, with bumped corners, a sunned and bumped spine, and a touch of edge wear. Both boards have damp stains. A couple pages have minimal underlining and marginalia. Gutter gapped at pages 144 and 145. Starting hinge gap at rear board. Note on the rear free endpaper. Prior owner's name on front free endpaper. London: MacMillan St Martin's Press, 1973. A beautifully presented blue hardback with gilt decoration and titles. Page edges yellowed slightly with a faint watermark down the leading edge. Otherwise in excellent condition with 331 clean and tight pages. Owners name in front. A very lovely book. 50% of profit to local Hospice. Reprint. Hard Cover. Near Fine. New York: Thomas Y. Crowell & Company, 1892. Leather Bound. Acceptable. NO. RARE Pages tight and clean!! This book is very old! - the date stamped by library in back is 1967, but book looks much older. Usual XLIB markings, previous owner's name plate inside front cover. Brown soft leather-like cover with gold lettering - faded at spine, folded over along edges and faded. Spine webbing shows in back, small spot shows in front. NY/London: Macmillan, 1888. Hardcover. Good. Reprint. Good Hardcover, reprint. Book has light fraying of spine ends and cover corners, fading spine and cover, cracking hinges. Clean text. Please Note: This book has been transferred to Between the Covers from another database and might not be described to our usual standards. Please inquire for more detailed condition information. Macmillan and Co. Ltd, 1909. Hardcover. Good. 1909. 331 pages. No dust jacket. Blue cloth with gilt lettering. Pages and binding are presentable with no major defects. Minor issues present such as mild cracking, inscriptions, inserts, light foxing, tanning and thumb marking. Overall a good condition item. Boards have mild shelf wear with light rubbing and corner bumping. Some light marking and sunning. NY: Thomas Y. Crowell, 1892. 319pp. Frontispiece engraving. Original silked floral pattern paper over white boards which are elaborately stamped in gilt. Corners bumped and rubbed through. Spine darkened. Size: 12mo - over 6¾ - 7¾" tall. Original Decorative Boards. Very Good/No Jacket. London, Macmillan, 1903;. Hardback. Golden Treasury Series. 6" x 4". Good- condition. xxxl, 323pp. Prize label on front pastedown. Green leather worn covers with gilt decoration on front, sunned decoration & title on front. Edges worn. All edges gilt. Internally very clean & tight. .
London: Macmillan and Co., Ltd, 1879. 1896 reprint. Blue cloth with gilt lettering to spine and gilt device of the Golden Treasury Series on the front. Spine sunned. Edges worn. Light rubbing to cloth on rear board. Top edges dust stained, fore edges rough cut. Pages age toned. End papers splitting, but book remains solid. B&W portrait frontis. Pp xxxi + 331 + 4 of publisher's catalogue.. Reprint. Cloth. Fair - Good/No Jacket. 16mo - over 5¾" - 6¾" tall. London: Macmillan, 1893. blue cloth, light rubbing, name to ffep, 309pp. Pocket Edition. Hard Back. Good/No Dj. 105x150mm. London: Macmillan. Good+ with no dust jacket. 1911. Hardcover. 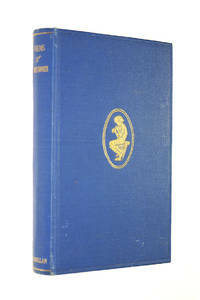 Macmillan 1911; Small 8vo hardback in blue cloth, no jacket, gilt detail to front, owners name to front end paper, frontispiece with tissue guard, small amount of spotting, some pencil marks, good plus; 331 pages . London : Dorling Kindersley. 1st edition. VG in pictorial boards. ISBN 0751302120. . 1995.